Our Flower Top Cupcake Box Set offers a charming display for single standard cupcakes. 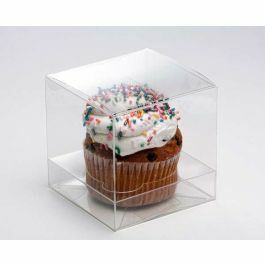 The set includes a 3 3/4" x 3 3/4" x 4" flower top box and a clear insert to hold your cupcake in place. Easily assemble by shaping along soft fold lines. Complete the look of your presentation with a colorful ribbon. Clear stickers are included. FDA approved. Are you looking for a unique way to package single cupcakes? Our Flower Top Cupcake Box Set makes each cupcake look special. 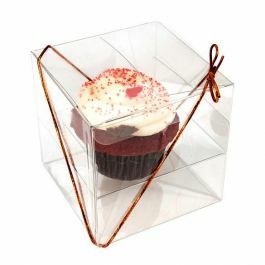 The box set includes a 3 3/4" x 3 3/4" x 4" flower top box and a clear insert to keep your cupcake in place. Your cupcake won't tip over in this crystal clear packaging. The 12 mil box is made of PET material for durability and exceptional clarity. All materials are food safe. Easily assemble this box by shaping along soft fold lines. Add a colorful ribbon for a nice finishing touch. Clear stickers are included for a tamper-proof seal. Outer Dimensions: 3 3/4" x 3 3/4" x 4"
A popular use of CBS212 is to hold a single cupcake or muffin.